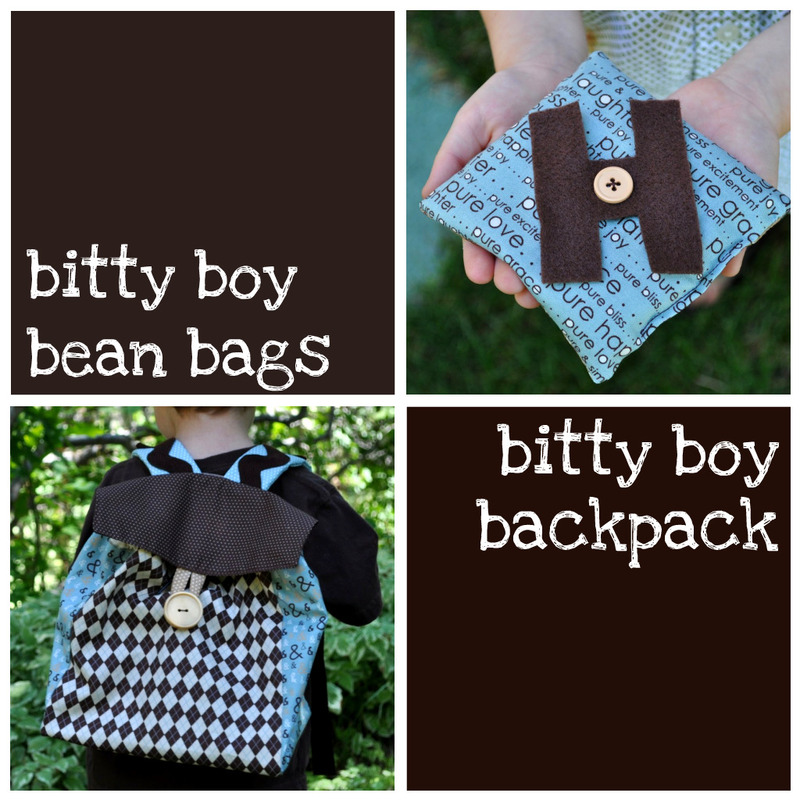 The perfect handmade gift for the little guy who isn’t old enough for school, but loves to learn and play. Guaranteed to provide hours of beanbag tossing fun. How many can you hold? 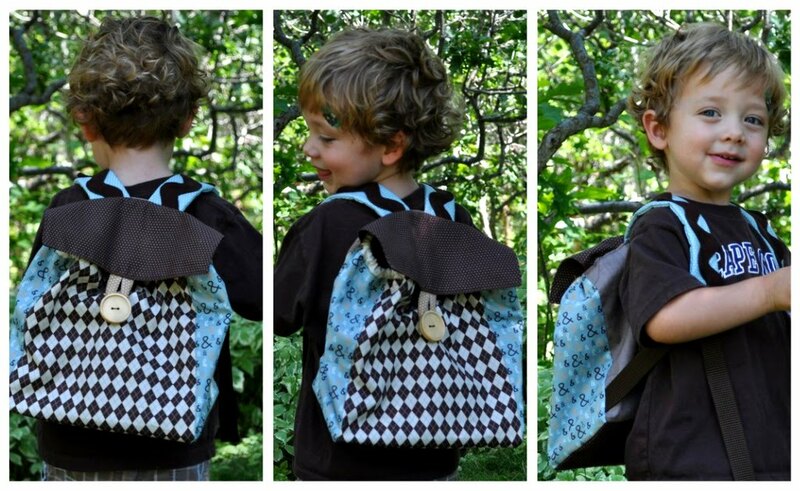 We’ll start with the backpack. Working with a layer cake made this project a whole lot easier. Take four squares and cut two in half. 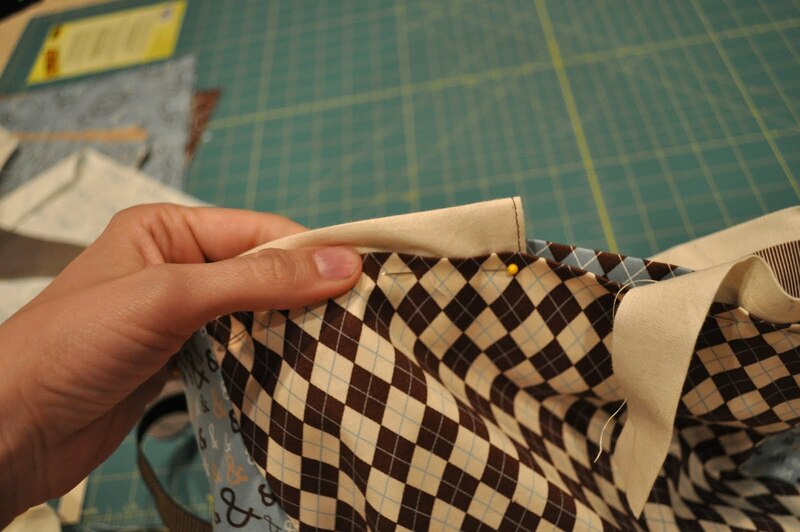 Sew the whole square to the half. Be sure to leave a quarter inch unsewn at the bottom. Continue this until you have a tube for the main part of the pack. 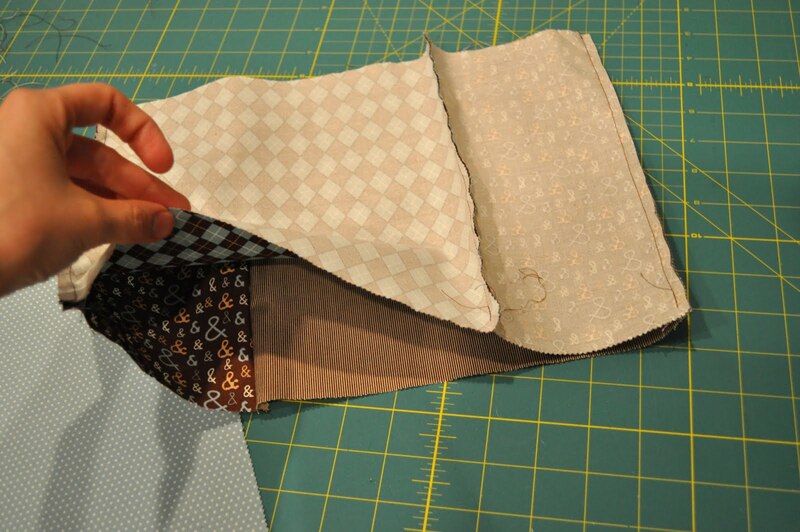 Sew a half piece to the bottom where you left the quarter inch unsewn. Repeat this exact process again, but add your straps this time. I made the straps about a foot long each and sewed them in at a 45 degree angle. Now you have your lining and your outside. (I inserted a piece of think plastic like you’d find on a thin binder, between these two layer to shape the pack a little more.) Insert the lining. Let’s move on to the shoulder straps. Cut one of the squares into fourths the long way. Add a layer of batting and sew the long sides. Invert and sew on the rick rack. 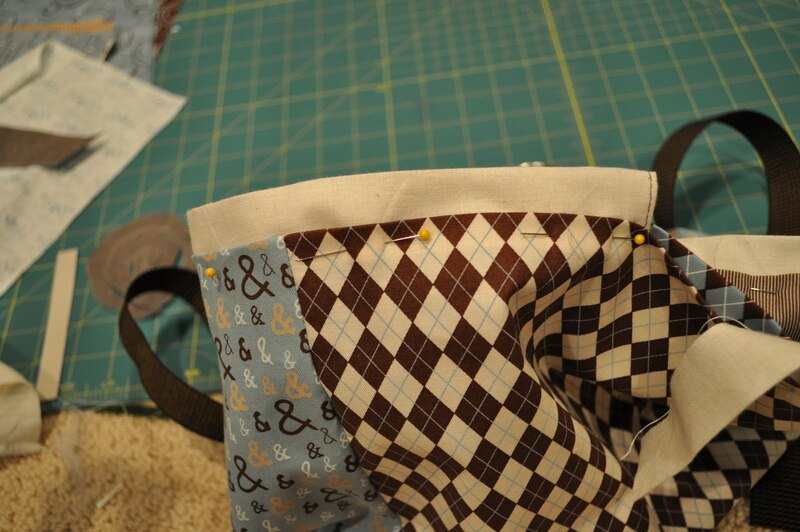 Tuck under the fabric to sew one end of the strap closed, but insert a loop of your strap fabric with the 2 D-rings on it. Do this for both straps. 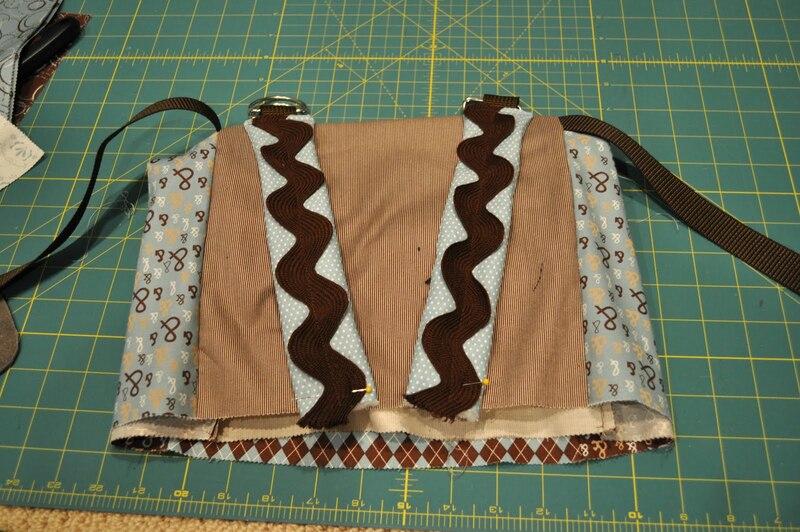 Pin straps in place and sew the tops of them to the outer layer. 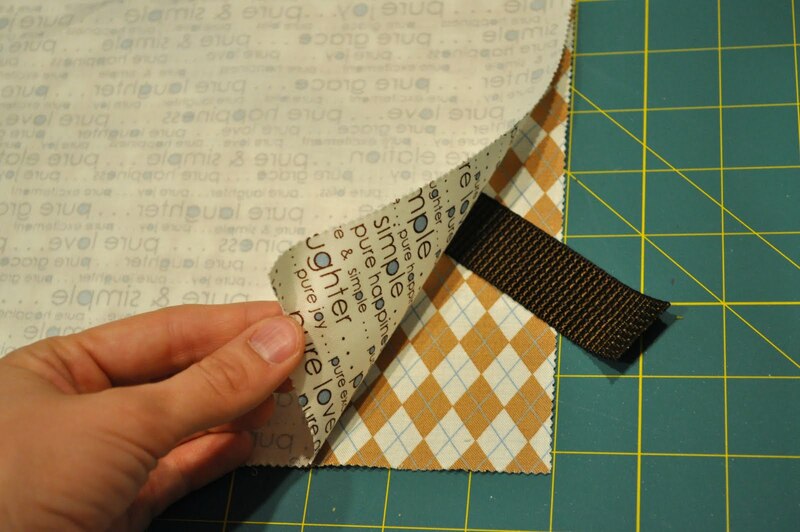 Cut another square in half and sew the edges to create your flap for the backpack. 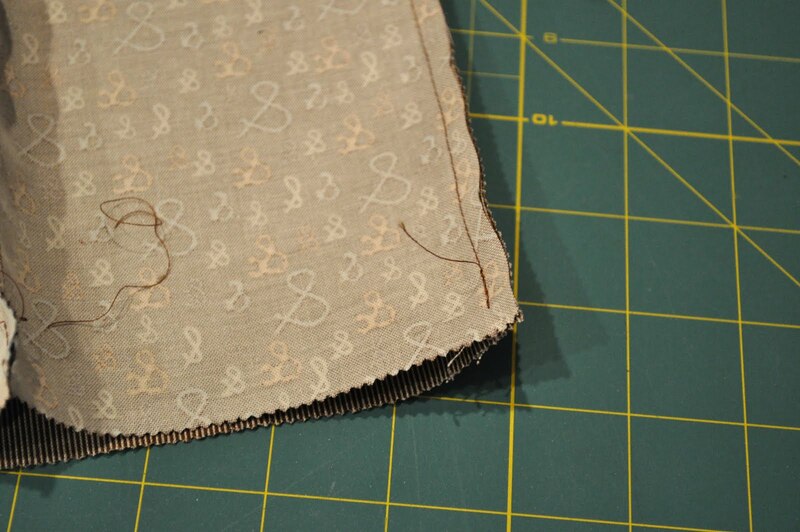 Sew a loop into it of you want a loop for a buttonhole (as shown below). 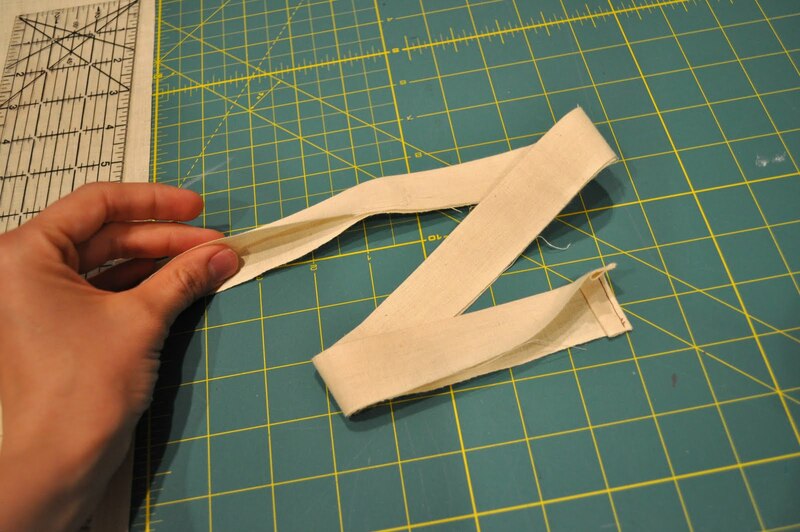 Sew this flap across the top as you did the straps. 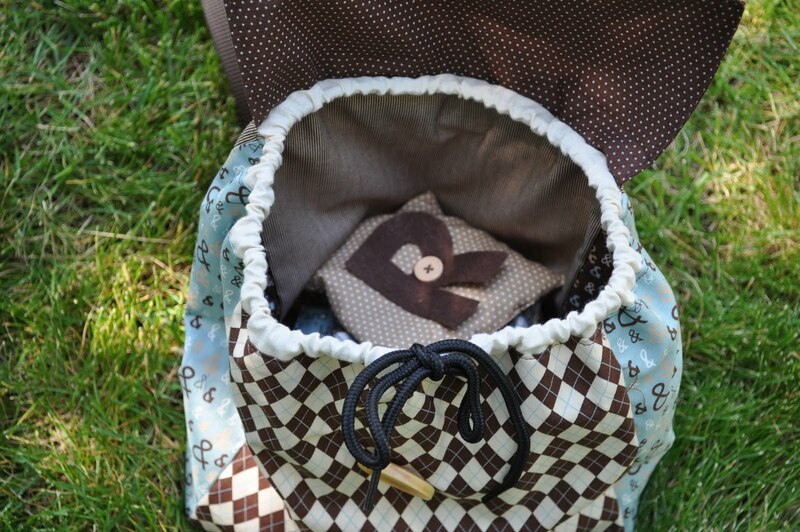 Create a casing for your drawstring by folding over an 18 inch by 1.5 inch strip (with finished ends). Next is the tricky pinning part. 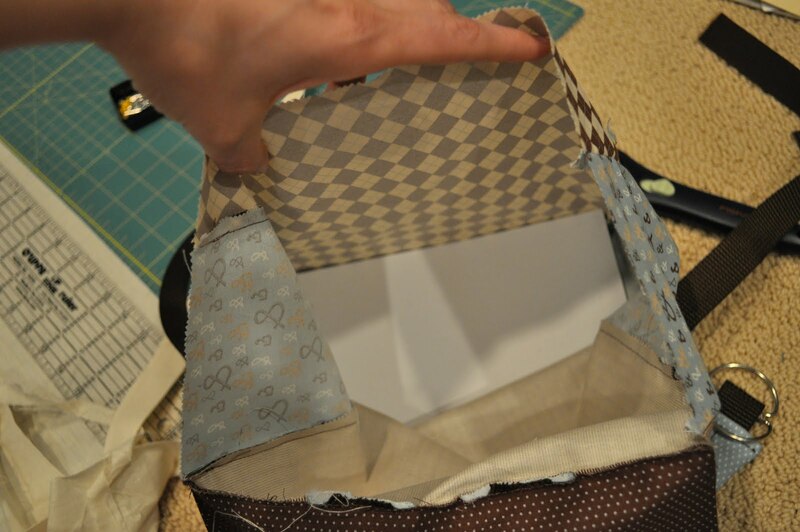 Fold over the lining and the outer bag and insert the casing. Pin all around the back. 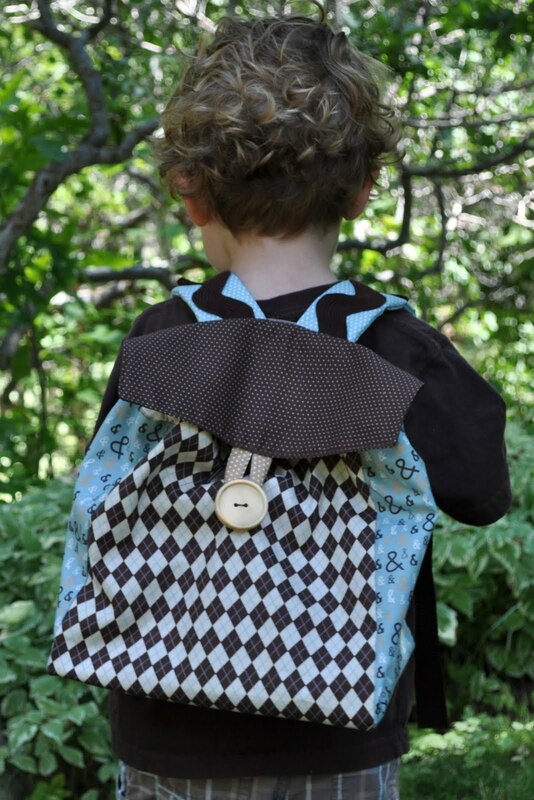 (You will have a lot to fold over in the back – the straps and flap.) Sew it as close to the casing as possible. Lace the shoestring through the casing and tie. Sew on your large button. All done! Now on to the bean bags. 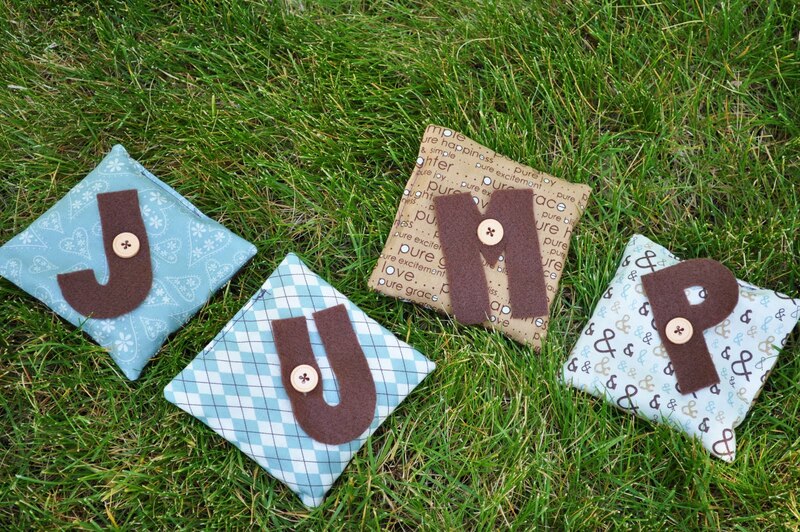 Cut each square into four 5″ squares. 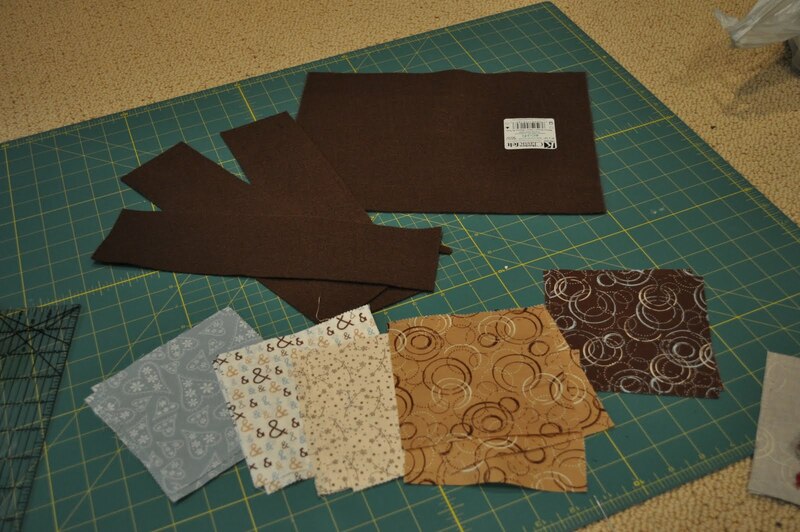 I prefer to mix up all the different fabrics. 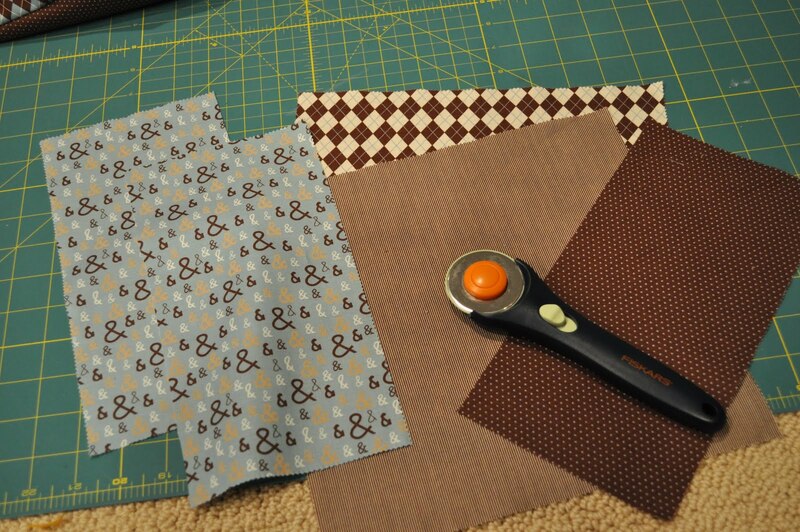 Sew one button onto every other square. Invert 2 small squares and sew together. Clip your corners. Invert the bags and fill. I use spilt peas, since they are cheap. 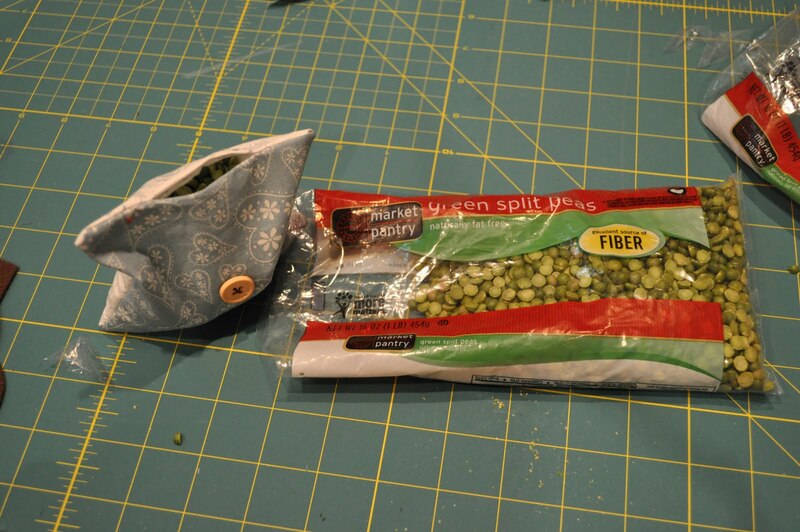 Tip: Cut off the corner of the spilt pea bags so you can pour them into the bean bag more efficiently. Sew them shut. 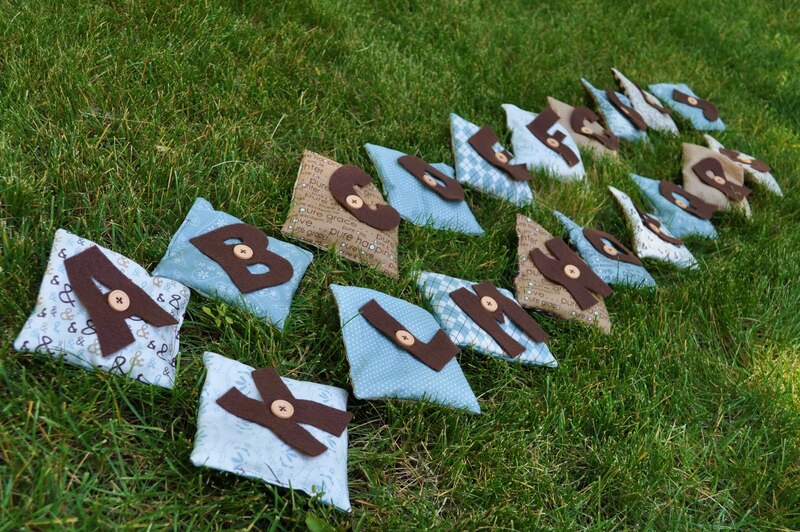 Take your sheets of felt and cut them into three-inch strips (to make sure all the letters will be the same height). 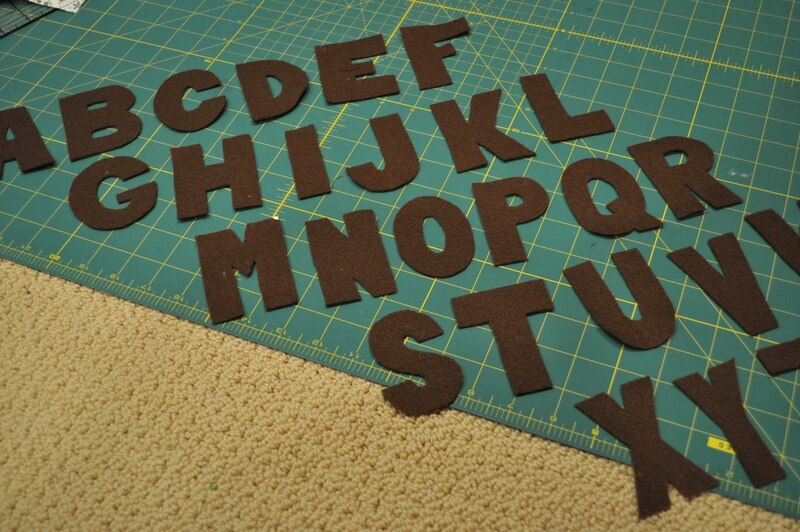 Cut out each letter of the alphabet. They don’t have to be perfect, just legible. 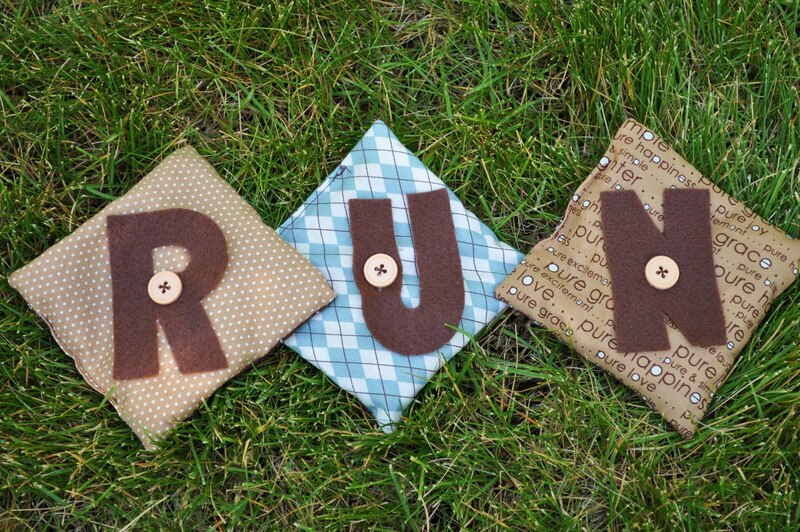 Cut slits for buttonholes in each letter. (Yes, some will end up being off-centered, but that’s okay. They will still work and look cute). Button each letter onto a bean bag. Not only will this little guy be learning his letters, but he’ll also learn how to button and unbutton. 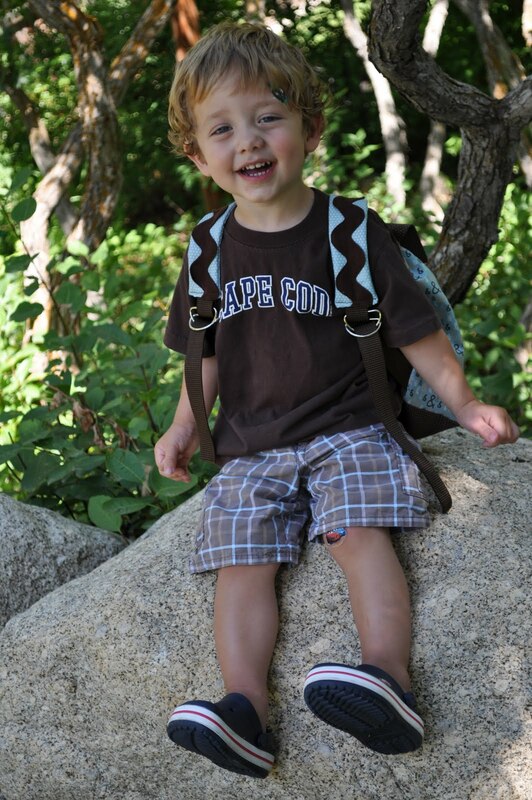 But best of all, he can lug them around in his own little backpack everywhere he goes. 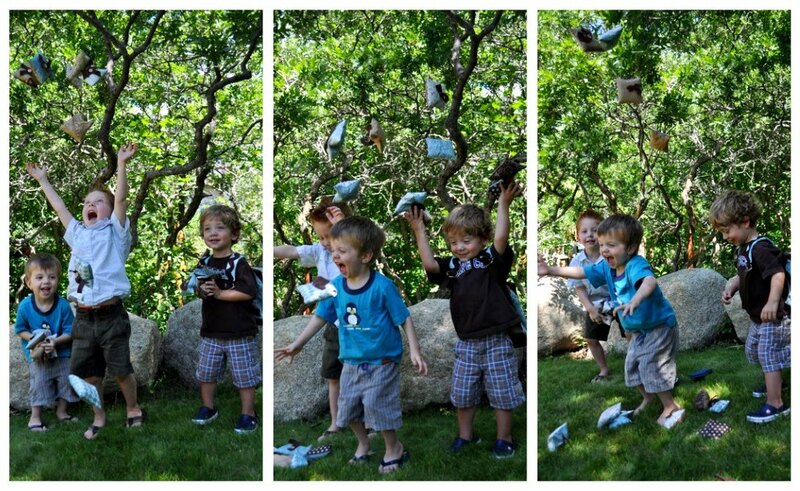 From Cheri at I Am Momma – Hear Me Roar. Stop in and visit anytime! 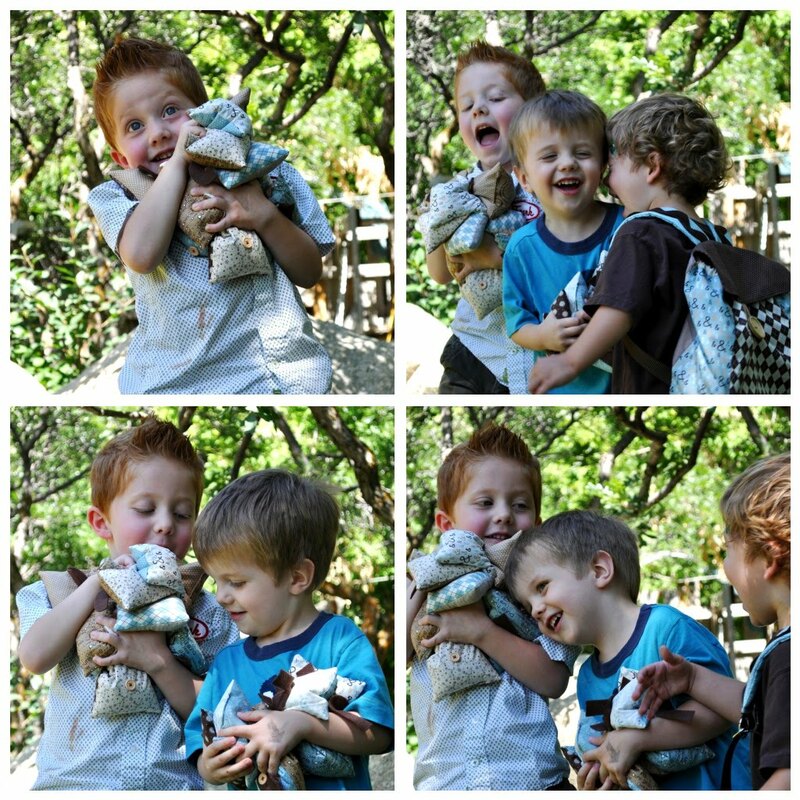 This entry was posted in Baby and Kids, Bags and Totes, Layer Cake, Moderate and tagged Pure, Sweetwater.